Register • Lost your Password? 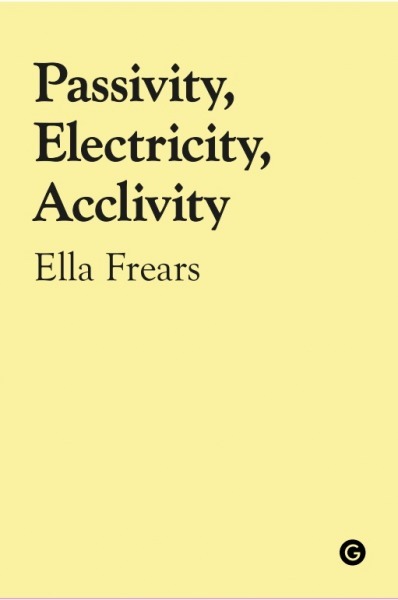 Ella Frears’ Passivity, Electricity, Acclivity is one fragmented but connected lyric essay. Where the lyric essays that are most frequently referenced (Maggie Nelson’s Bluets, and Claudia Rankine’s Don’t Let Me Be Lonely and Citizen) tend to work in small blocks of prose (or prose-poetry), Frears explodes the lyric essay form, producing the familiar blocks of prose, but staggering them between line-broken sections that are still essayistic. In this, she recreates a rollercoaster ride: leading us slowly up the inclines, hurtling around twists and bends, plummeting us into the uncertain. but something new in me. The opening’s sensory focus drops the reader into Frears’ atmospheric lines and into the pamphlet’s central concern: how can we possibly know ourselves? how much it mattered to me. If aloneness is thought to be a state where one might ‘get closer’ to oneself, have a greater sense of fixed self, then Frears reminds us that there is no certainty, that existence is based on perception, memory and interaction – and interaction can reveal something even more frightening about ourselves. When reading Passivity, Electricity, Acclivity, I was reminded of an essay by Frears’ editor for this pamphlet, Jack Underwood. I read The Shape of Oblivion: Poetry and the Rollercoaster on my phone years ago, on a train platform, on a winter evening as I waited to go home for Christmas. This memory has remained so clearly with me because, standing hunched over my phone, breathing into my scarf for warmth, I realised that poetry could be written about in an exciting way – not just for university essays, or academic books – and that our everyday lives – going to theme parks, watching television, going to the supermarket – were integral to how we can try to understand poetry, and how we write poetry as well, and this is essentially how we try to understand ourselves, all the while knowing that it is a futile endeavour. In his essay, Underwood writes that ‘form in poems is not to do with so-called rules, or the number of lines and all that guff, but more with how an argument is literally “shaped”,’ and that ‘form is the whole shape of the argument, and poetry and rollercoasters are shaped deliberately unusually, for deliberately unusual effects.’ This idea of argument and shape is crucial to understanding how Frears’s pamphlet moves. of a man who fitted my description. body, together in the dark, is it him? if his eyelids lift. No. because I failed to identify the sleeping man. I thought I was special, chosen. to leave sleeping. Please understand. rise against a bright blue sky behind you. I’m already carrying so much. I nodded for him to follow. Did he know that I hadn’t? who knows, he might be right. I lived in a house for a year with six strangers. One of them was a Catholic girl called Lucy. Lucy is an unsettling presence, one that challenges the speaker’s reality and sense of self. (I can’t help but think of Kendrick Lamar’s Lucy, her seduction, and the name’s similarity to Lucifer). If the self was unstable in the speaker’s childhood and adolescence, Lucy problematises it further and to extremes, so that when the speaker asks, ‘What can a woman take from a woman?’ it becomes apparent that the biggest mistake that someone can make is to under-estimate a threat or fail to see a threat at all – especially if that threat might come from within. These stories take on a fabulist tone, engaging with the essay’s over-arching concerns of identity, imperceptible threat, and near-abduction, but constantly resist a simple, straightforward moral. How to avoid a problem of identity or threat is not explained, and so we are held over the drop at the top of the incline, knowing that we will be thrown forwards, both anticipating and dreading it. otherwise none of this works. The admission of becoming someone else, someone who poses a significant threat, and specifically in aid of getting something to ‘work’, shows how entirely the speaker’s sense of self is destabilised, and how selves are performative acts, a skin we wear or body we inhabit in order to make things ‘work’. This makes us question how we have been manipulated: what story have we been allowed to see, and what has been omitted? There comes a creeping sense that the ‘you’ is in fact a direct address to the reader, that all along we have been watching the speaker’s performance, unable to put our finger on its strangeness. The ending of Passivity, Electricity, Acclivity is so perfect in its composition and execution that I can’t reveal it here, because, like the speaker says, ‘none of this works’ unless you read the whole thing, in its entirety, in one go. When I read the ending, I felt like I was finally being tipped over into that final descent of the rollercoaster; I wanted to scream. You can find out more about Passivity, Electricity, Acclivity from the Goldsmiths Press website. Roller-coaster by Jeremy Perez Photo. This image has been cropped and filtered.